Can Superman see through superconductors? An important question needs to be answered by the editors of DC Comics! Superman, one of their flagship characters, is famously unable to see through lead — even though he can see microscopic substances, and he can see across immense distances. What is it about lead that stymies Superman's super-vision? And would he have the same difficulty seeing through superconductors? Super-science needs the answers to these questions! 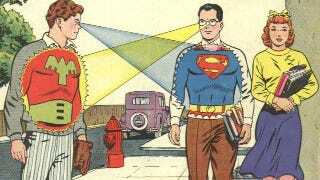 An easy reason why Superman can't see through lead is because his vision is X-ray vision. X-rays notoriously fail to penetrate lead. But as the years have passed, and as Superman's super-vision has gotten more complicated, we've learned that it's not just x-rays that allowed him to see through objects. He's able to see things that are too small, too soft, and too detailed for x-rays to ever be able to pick them out. Superman's super-vision is, at this point, nearly all-powerful. But it still can't manage to get through lead, for some reason. The Thomson effect is not very well known, in part because it came into being by swallowing two other effects. Charles Athanase Peltier discovered the Peltier Effect when he noticed that when an electric current was passed through two materials, one cooled and the other heated. Thomas Johann Seebeck noticed exactly the opposite. When two different temperatures were applied to the same materials, a voltage and subsequent electric current developed between them. William Thomson came in, we can only assume on a white horse, and saw that these were two sides of the same coin. He came up with a way to measure the temperature gradient in a single material with a current going through it. Once that is established, it's possible to come up with the gradients of any other material. Lead is often used as the baseline for these tests. It is commonly known as the only metal for which there is no Thomson effect whatsoever. It was only recently that it was shown to have the barest flickering of a Thomson Effect. This is not, necessarily, why Superman can't see through it — but there is a way we can check. Superconductors, by definition, have no Thomson Effect. These materials, when dropped down to temperatures within spitting distance of absolute zero, have no electrical resistance. Since it's this resistance that causes heat, the current flows through a superconductor without heating it, and its actual Thomson Effect is right at zero. So if Superman tries, and fails, to look through a superconductor, we'll know once and for all the reason why he can't see through lead. And maybe that, in turn, will give us a greater insight into how Superman's super-vision actually works. Make it happen, DC!